For the branch retail, commercial, and credit card bank in the U.S., see CHASE. JPMorgan Chase Headquarters at 270 Park Avenue in New York. JPMorgan Chase & Co. (NYSE: JPM) is an American global securities, investment banking and retail banking firm. It is a major provider of financial services, with assets of $2 trillion, and is the U.S. banking institution having the second largest market capitalization and third largest domestic deposit base (behind Wells Fargo and Bank of America). The hedge fund unit of JPMorgan Chase is the largest hedge fund in the United States with $53.5 billion in assets as of the end of 2009. It was formed in 2000, when Chase Manhattan Corporation merged with J.P. Morgan & Co. The J.P. Morgan brand is used by the Investment Bank as well as the Asset Management, Private Banking, Private Wealth Management, and Treasury & Securities Services divisions. Fiduciary activity within Private Banking and Private Wealth Management is done under the aegis of JPMorgan Chase Bank, N.A.—the actual trustee. The CHASE brand is used for credit card services in the United States and Canada, the bank's retail banking activities in the United States, and commercial banking. The corporate headquarters are in New York City and the retail and commercial bank is headquartered in Chicago. JPMorgan Chase is one of the Big Four banks of the United States with Bank of America, Citigroup and Wells Fargo. The current J.P.Morgan logo used for the company's Investment Banking, Asset Management, and Treasury & Securities Services units, as of June 2008. Corporate - Includes the company's private equity; One Equity Partners, Treasury and Corporate functions. JPMorgan Chase, in its current structure, is the result of the combination of several large U.S. banking companies over the last decade including Chase Manhattan Bank, J.P. Morgan & Co., Bank One, Bear Stearns and Washington Mutual. Going back further, its predecessors include major banking firms among which are Chemical Bank, Manufacturers Hanover, First Chicago Bank, National Bank of Detroit, Texas Commerce Bank, Providian Financial and Great Western Bank. The New York Chemical Manufacturing Company was founded in 1823 as a maker of various chemicals. In 1824, the company amended its charter to perform banking activities and created the Chemical Bank of New York. After 1851, the bank was separated from its parent and grew organically and through a series of mergers, most notably with Corn Exchange Bank in 1954, Texas Commerce Bank (a large bank in Texas) in 1986, and Manufacturer's Hanover Trust Company in 1991 (the first major bank merger "among equals"). In the 1980s and early 1990s, Chemical emerged as one of the leaders in the financing of leveraged buyout transactions. In 1984, Chemical launched Chemical Venture Partners to invest in private equity transactions alongside various financial sponsors. By the late 1980s, Chemical developed its reputation for financing buyouts, building a syndicated leveraged finance business and related advisory businesses under the auspices of pioneering investment banker, Jimmy Lee. At many points throughout this history, Chemical Bank was the largest bank in the United States (either in terms of assets or deposit market share). In 1996, Chemical Bank acquired the Chase Manhattan Corporation taking the more prominent Chase name. In 2000, the combined company acquired J.P. Morgan & Co. and combined the two names to form what is today JPMorgan Chase & Co. JPMorgan Chase retains Chemical Bank's headquarters at 270 Park Avenue and stock price history. Logo used by Chase following the merger with the Manhattan Bank in 1955. The Chase Manhattan Bank was formed upon the 1955 purchase of Chase National Bank (established in 1877) by the Bank of the Manhattan Company (established in 1799), the company's oldest predecessor institution. The Bank of the Manhattan Company was the creation of Aaron Burr, who transformed The Manhattan Company from a water carrier into a bank. Led by David Rockefeller during the 1970s and the 1980s, Chase Manhattan emerged as one of the largest and most prestigious banking concerns, with leadership positions in syndicated lending, treasury and securities services, credit cards, mortgages, and retail financial services. Weakened by the real estate collapse in the early 1990s, it was acquired by Chemical Bank in 1996 retaining the prominent Chase name. Prior to its notable merger with J.P. Morgan & Co., the new Chase expanded the investment and asset management groups through two acquisitions. In 1999, it acquired San Francisco-based Hambrecht & Quist for $1.35 billion. In April 2000, UK-based Robert Fleming & Co. was sold to the new Chase Manhattan Bank for $7.7 billion. At the turn of the nineteenth century, obtaining a bank charter required an act of the state legislature. This of course injected a powerful element of politics into the process and invited what today would be called corruption but then was regarded as business as usual. Hamilton's political enemy—and eventual murderer—Aaron Burr was able to create a bank by sneaking a clause into a charter for a company, called the Manhattan Company, to provide clean water to New York City. The innocuous-looking clause allowed the company to invest surplus capital in any lawful enterprise. Within six months of the company's creation, and long before it had laid a single section of water pipe, the company opened a bank, the Bank of the Manhattan Company. Still in existence, it is today J.P.Morgan Chase, the second largest bank in the United States. Main article: J.P. Morgan & Co. The heritage of the House of Morgan traces its roots to the partnership of Drexel, Morgan & Co., which in 1895 was renamed J.P. Morgan & Co. (see also: J. Pierpont Morgan). Arguably the most influential financial institution of its era, J.P. Morgan & Co. financed the formation of the United States Steel Corporation, which took over the business of Andrew Carnegie and others and was the world's first billion-dollar corporation. In 1895, J.P. Morgan & Co. supplied the United States government with $62 million in gold to float a bond issue and restore the treasury surplus of $100 million. In 1892, the company began to finance the New York, New Haven and Hartford Railroad and led it through a series of acquisitions that made it the dominant railroad transporter in New England. Although his name was big, Morgan owned only 19% of Morgan assets. The rest was owned by the Rothschild family following a series of bailouts and rescues attributed by some to Morgan's stubborn will and seemingly "non-existent" investment savvy. 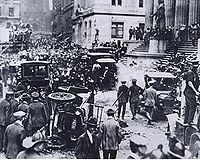 September 16, 1920: a bomb exploded in front of the headquarters of J.P. Morgan Inc. at 23 Wall Street, injuring 400 and killing 38 people. Built in 1914, 23 Wall Street was known as the "House of Morgan," and for decades the bank's headquarters was the most important address in American finance. At noon, on September 16, 1920, a terrorist bomb exploded in front of the bank, injuring 400 and killing 38. Shortly before the bomb went off, a warning note was placed in a mailbox at the corner of Cedar Street and Broadway. The warning read: "Remember we will not tolerate any longer. Free the political prisoners or it will be sure death for all of you. American Anarchists Fighters." While theories abound about who was behind the Wall Street bombing and why they did it, after 20 years of investigation the FBI rendered the case inactive without ever finding the perpetrators. In August 1914, Henry P. Davison, a Morgan partner, traveled to the UK and made a deal with the Bank of England to make J.P. Morgan & Co. the monopoly underwriter of war bonds for the UK and France. The Bank of England became a "fiscal agent" of J.P. Morgan & Co., and vice-versa. The company also invested in the suppliers of war equipment to Britain and France. Thus, the company profited from the financing and purchasing activities of the two European governments. In the 1930s, all of J.P. Morgan & Co. along with all integrated banking businesses in the United States, was required by the provisions of the Glass–Steagall Act to separate its investment banking from its commercial banking operations. J.P. Morgan & Co. chose to operate as a commercial bank, because at the time commercial lending was perceived as more profitable and prestigious. Additionally, many within J.P. Morgan believed that a change in political climate would eventually allow the company to resume its securities businesses but it would be nearly impossible to reconstitute the bank if it were disassembled. In 1935, after being barred from securities business for over a year, the heads of J.P. Morgan spun off its investment-banking operations. Led by J.P. Morgan partners, Henry S. Morgan (son of Jack Morgan and grandson of J. Pierpont Morgan) and Harold Stanley, Morgan Stanley was founded on September 16, 1935 with $6.6 million of nonvoting preferred stock from J.P. Morgan partners. In order to bolster its position, in 1959, J.P. Morgan merged with the Guaranty Trust Company of New York to form the Morgan Guaranty Trust Company. The bank would continue to operate as Morgan Guaranty Trust through the 1980s, before beginning to migrate back toward the use of the J.P. Morgan brand. In 1984, the group finally purchased the Purdue National Corporation of Lafayette Indiana, uniting a history between the two figures of Salmon Portland Chase and John Purdue. In 1988, the company once again began operating exclusively as J.P. Morgan & Co. In 2004, JPMorgan Chase merged with Chicago based Bank One Corp., bringing on board current chairman and CEO Jamie Dimon as president and COO and designating him as CEO William B. Harrison, Jr.'s successor. Dimon's pay was pegged at 90% of Harrison's. Dimon quickly made his influence felt by embarking on a cost-cutting strategy, and replaced former JPMorgan Chase executives in key positions with Bank One executives—many of whom were with Dimon at Citigroup. Dimon became CEO in January 2006 and Chairman in December 2006. Bank One Corporation was formed upon the 1998 merger between Banc One of Columbus, Ohio and First Chicago NBD. These two large banking companies had themselves been created through the merger of many banks. This merger was largely considered a failure until Dimon—recently ousted as President of Citigroup—took over and reformed the new firm's practices—especially its disastrous technology mishmash inherited from the many mergers prior to this one. Dimon effected more than sufficient changes to make Bank One Corporation a viable merger partner for JPMorgan Chase. Bank One Corporation traced its roots to First Bancgroup of Ohio, founded as a holding company for City National Bank of Columbus, Ohio and several other banks in that state, all of which were renamed "Bank One" when the holding company was renamed Banc One Corporation. With the beginning of interstate banking they spread into other states, always renaming acquired banks "Bank One", though for a long time they resisted combining them into one bank. After the First Chicago NBD merger, adverse financial results led to the departure of CEO John B. McCoy, whose father and grandfather had headed Banc One and predecessors. Dimon was brought in to head the company. JPMorgan Chase completed the acquisition of Bank One in the third quarter of 2004. The former Bank One and First Chicago headquarters in Chicago serve as the headquarters of Chase, JPMorgan Chase's commercial and retail banking subsidiary. At the end of 2007, Bear Stearns & Co. Inc. was the fifth largest investment bank in the United States but its market capitalization had deteriorated through the second half of 2007. On Friday, March 14, 2008 Bear Stearns lost 47% of its equity market value to close at $30.00 per share as rumors emerged that clients were withdrawing capital from the bank. Over the following weekend it emerged that Bear Stearns might prove insolvent and on or around March 15, 2008 the Federal Reserve engineered a deal to prevent a wider systemic crisis from the collapse of Bear Stearns. On March 24, 2008, after considerable public discontent by Bear Stearns shareholders over the low acquisition price threatened the deal's closure, a revised offer was announced at approximately $10 per share. Under the revised terms, JPMorgan also immediately acquired a 39.5% stake in Bear Stearns (using newly issued shares) at the new offer price and gained a commitment from the board (representing another 10% of the share capital) that its members would vote in favor of the new deal. With sufficient commitments thus in hand to ensure a successful shareholder vote, the merger was completed on June 2, 2008. On September 25, 2008, JPMorgan Chase bought most of the banking operations of Washington Mutual from the receivership of the FDIC. That night, the Office of Thrift Supervision, in what was by far the largest bank failure in American history, had seized Washington Mutual Bank and placed it into receivership. The FDIC sold the bank's assets, secured debt obligations and deposits to JPMorgan Chase & Co for $1.836 billion, which re-opened the bank the following day. As a result of the takeover, Washington Mutual shareholders lost all their equity. JPMorgan Chase raised $10 billion in a stock sale to cover writedowns and losses after taking on deposits and branches of Washington Mutual. Through the acquisition, JPMorgan now owns the former accounts of Providian Financial, a credit card issuer WaMu acquired in 2005. The company announced plans to complete the rebranding of Washington Mutual branches to Chase by late 2009. Chief executive Alan H. Fishman was flying from New York to Seattle on the day the bank was closed, and eventually received a $7.5 million sign-on bonus and cash severance of $11.6 million after being CEO for 17 days. In 2006, JPMorgan Chase purchased Collegiate Funding Services, a portfolio company of private equity firm Lightyear Capital, for $663 million. CFS was used as the foundation for the Chase Student Loans, previously known as Chase Education Finance. In April, 2006, JPMorgan Chase announced it would swap its corporate trust unit for The Bank of New York Co.'s retail and small business banking network. The swap valued The Bank of New York business at $3.1 billion and JPMorgan's trust unit at $2.8 billion and gave Chase access to 338 additional branches and 700,000 new customers in New York, New Jersey, and Indiana. In March, 2008, JPMorgan acquired the UK-based carbon offsetting company ClimateCare. In November, 2009, JPMorgan announced it would acquire the balance of JPMorgan Cazenove, an advisory and underwriting joint venture established in 2004 with the Cazenove Group, for GBP1 billion. Although the old Chase Manhattan Bank's headquarters were once located at the One Chase Manhattan Plaza building in downtown Manhattan, the current world headquarters for JPMorgan Chase & Co. are located at 270 Park Avenue. The bulk of North American operations take place in four buildings located adjacent to each other on Park Avenue in New York City: the former Union Carbide Building at 270 Park Avenue, the hub of sales and trading operations, and the original Chemical Bank building at 277 Park Avenue, where most investment banking activity took place. Asset and wealth management groups are located at 245 Park Avenue and 345 Park Avenue. Other groups are located in the former Bear Stearns building at 383 Madison Avenue. CHASE, the U.S. and Canada, retail, commercial, and credit card bank is headquartered in Chicago at the Chase Tower.Chicago. The Asia Pacific headquarters for JPMorgan is located in Hong Kong at Chater House. Approximately 10,000 employees are located in Columbus at the McCoy Center, the former Bank One offices. The bank moved some of its operations to the JPMorgan Chase Tower in Houston, when it purchased Texas Commerce Bank. In August 2008, the bank announced plans to construct a new European headquarters, based at Canary Wharf, London. The Card Services division has its headquarters in Wilmington, Delaware, with Card Services offices in Elgin, Illinois; Springfield, Missouri; Frederick, Maryland; San Antonio and Mumbai. There are also large operations centers in Brooklyn; Columbus; Dallas; Indianapolis; Milwaukee; Toronto; Rochester, New York; Fort Worth, Texas; Tampa, Florida; Orlando, Florida; Louisville, Kentucky; Newark, Delaware; Phoenix, Arizona and Burlington, Ontario. Operations centers in the United Kingdom are located in Bournemouth, Glasgow, London, Liverpool and Swindon of which London hosts the European headquarters. There are also backoffice and technology operations offices based in Manila, Cebu, Philippines, Mumbai , Bangalore, Hyderabad, New Delhi , Buenos Aires and Mexico City. J.P. Morgan is a leader in wholesale financial services serving one of the largest client franchises in the world. Clients include corporations, institutional investors, hedge funds, governments and affluent individuals in more than 100 countries. With the Global headquarters outside USA, the Europe, Middle East and Africa (EMEA) headquarters located in London & Asia Pacific headquarters located in Hong Kong. In December 2002, Chase paid fines totaling $80 million, with the amount split between the states and the federal government. The fines were part of a settlement involving charges that ten banks, including Chase, deceived investors with biased research. The total settlement with the ten banks was $1.4 billion. The settlement required that the banks separate investment banking from research, and ban any allocation of IPO shares. Chase paid out over $2 billion in fines and legal settlements for their role in financing Enron Corporation, which collapsed amid a financial scandal in 2001. In 2003, Chase paid $160 million in fines and penalties to settle claims by the Securities and Exchange Commission and the Manhattan district attorney’s office. In 2005, Chase paid $2.2 billion to settle a lawsuit filed by investors in Enron. JPMorgan Chase, which helped underwrite $15.4 billion of WorldCom's bonds, agreed in March 2005 to pay $2 billion; that was 46 percent, or $630 million, more than it would have paid had it accepted an investor offer in May 2004 of $1.37 billion. J.P. Morgan was the last big lender to settle. Its payment is the second largest in the case, exceeded only by the $2.6 billion accord reached in 2004 by Citigroup. In March 2005, 16 of WorldCom's 17 former underwriters reached settlements with the investors. In November 2009, JPMorgan Chase & Co. agreed to a $722 million settlement with the U.S. Securities and Exchange Commission to end a probe into sales of derivatives that helped push Alabama’s most populous county to the brink of bankruptcy. The settlement came a week after Birmingham, Alabama Mayor Larry Langford was convicted on 60 counts of bribery, money laundering, and tax evasion related to bond swaps for Jefferson County, Alabama. The SEC alleged that J.P. Morgan, which had been chosen by the county commissioners to underwrite the floating-rate sewer bond deals and provide interest-rate swaps, had made undisclosed payments to close friends of the commissioners in exchange for the deal. J.P. Morgan then allegedly made up for the costs by charging higher interest rates on the swaps. In June 2010, J.P. Morgan Securities was fined 33.32 million pounds sterling ($49.12 million) by the UK Financial Services Authority (FSA) for failing to protect billions of dollars of client money over almost seven years. The firm had erroneously failed to properly segregate client funds from corporate funds following the merger of Chase and J.P. Morgan, resulting in a violation of FSA regulations but no losses to clients. J.P. Morgan Securities reported the incident to the FSA, corrected the errors, and cooperated in the ensuing investigation, resulting in the fine being reduced 30% from an original amount of £47.6 million. In January 2011, JPMorgan Chase admitted that it wrongly overcharged several thousand military families for their mortgages, including active duty personnel in Afghanistan. The bank also admitted it improperly foreclosed on more than a dozen military families; both actions were in clear violation of the Servicemembers Civil Relief Act which automatically lowers mortgage rates to 6 percent, and bars foreclosure proceedings of active duty personnel. The overcharges may have never come to light were it not for legal action taken by Marine Capt. Jonathan Rowles, a fighter pilot. Both Capt. Rowles and his spouse Julia accused Chase of violating the law and harassing the couple for nonpayment. An official stated that the situation was "grim", and Chase initially stated it would be refunding up to $2,000,000 to those who were overcharged, and that families improperly foreclosed on have gotten or will get their homes back. Chase has acknowledged that as many as 6,000 active duty military personnel were illegally overcharged, and more than 18 military families homes were wrongly foreclosed. In April, Chase agreed to pay a total of $27 million in compensation to settle the class-action suit. Chase Field, Phoenix, Arizona, - Arizona Diamondbacks, MLB. Chase Auditorium (formerly Bank One Auditorium) in Chicago. The JPMorgan Chase Corporate Challenge, owned and operated by JPMorgan Chase, is the largest corporate road racing series in the world with over 200,000 participants in 12 cities in six countries on five continents. It has been held annually since 1977 and the races range in size from 4,000 entrants to more than 60,000. JPMorgan Chase is the official sponsor of the US Open. Dina Dublon - member of the board of directors of Microsoft, Accenture and PepsiCo and former executive vice president and chief financial officer of JPMorgan Chase. Maria Elena Lagomasino - member of the board of directors of The Coca-Cola Company and former CEO of JPMorgan Private Bank. ^ a b c d e f g "2010 Form 10-K, JPMorgan Chase & Co.". United States Securities and Exchange Commission. http://www.sec.gov/Archives/edgar/data/19617/000095012311019773/y86143e10vk.htm. ^ Tully, Shawn (February 27, 2009). "Will the banks survive?". Fortune Magazine/CNN Money. http://money.cnn.com/2009/02/27/news/economy/tully_banks.fortune/index.htm?source=yahoo_quote. Retrieved December 17, 2009. ^ "Citigroup posts 4th straight loss; Merrill loss widens". USA Today. Associated Press. 2008-10-16. http://www.usatoday.com/money/companies/earnings/2008-10-16-citigroup_N.htm. Retrieved December 17, 2009. ^ Winkler, Rolfe (August 21, 2009). "Big banks still hold regulators hostage". Reuters, via Forbes.com. http://www.forbes.com/feeds/afx/2009/08/21/afx6803343.html. Retrieved December 17, 2009. ^ Temple, James; The Associated Press (November 18, 2008). "Bay Area job losses likely in Citigroup layoffs i". The San Francisco Chronicle. http://www.sfgate.com/cgi-bin/article.cgi?f=/c/a/2008/11/17/BURD146AIA.DTL. Retrieved December 17, 2009. ^ Dash, Eric (August 23, 2007). "4 Major Banks Tap Fed for Financing". The New York Times. http://www.nytimes.com/2007/08/23/business/23discount.html. Retrieved December 17, 2009. ^ Pender, Kathleen (November 25, 2008). "Citigroup gets a monetary lifeline from feds". The San Francisco Chronicle. http://www.sfgate.com/cgi-bin/article.cgi?f=/c/a/2008/11/24/BUST14B71M.DTL. Retrieved December 17, 2009. ^ de la Merced, Michael J. (June 16, 2008). "JPMorgan’s Stately Old Logo Returns for Institutional Business". The New York Times. http://www.nytimes.com/2008/06/16/business/media/16bank.html?_r=1. Retrieved December 14, 2009. ^ Guerrera, Francesco (March 16, 2008). "Bear races to forge deal with JPMorgan". Financial Times. http://www.ft.com/cms/s/e2206ed2-f380-11dc-b6bc-0000779fd2ac.html. Retrieved 2008-03-16. ^ Quinn, James (March 19, 2008). "JP Morgan Chase bags bargain Bear Stearns". London: Telegraph.co.uk. http://www.telegraph.co.uk/money/main.jhtml?xml=/money/2008/03/17/cnbear117.xml. Retrieved 2008-03-19. ^ Ellis, David. "JPMorgan buys WaMu", CNNMoney.com, 2008-09-25. ^ "JPMorgan Buys Rest of Cazenove for 1 Billion Pounds". Bloomberg. November 19, 2009. http://www.bloomberg.com/apps/news?pid=20601087&sid=aExgpC1XyF7g. ^ The History of JPMorgan Chase & Co.: 200 Years of Leadership in Banking, company-published booklet, ©2008, p. 19. Retrieved 2010-07-15. ^ The History of JPMorgan Chase & Co.: 200 Years of Leadership in Banking, company-published booklet, ©2008, p. 6. Union National Bank and National Bank of Commerce in Houston were predecessor banks to TCB. Retrieved 2010-07-15. ^ The History of JPMorgan Chase & Co.: 200 Years of Leadership in Banking, company-published booklet, ©2008, p. 3. New York Manufacturing Co. began in 1812 as a manufacturer of cotton processing equipment and switched to banking five years later. Retrieved 2010-07-15. ^ The History of JPMorgan Chase & Co.: 200 Years of Leadership in Banking, company-published booklet, ©2008. Founder John Thompson named the bank in honor of his late friend, Salmon P. Chase. Retrieved 2010-07-15. ^ Other Successors to the break-up of The House of Morgan: Morgan Stanley and Morgan, Grenfell & Co.
^ The History of JPMorgan Chase & Co.: 200 Years of Leadership in Banking, company-published booklet, ©2008, p. 5. Predecessor to J.P. Morgan & Co. was Drexel, Morgan & Co., est. 1871. Retrieved 2010-07-15. Other predecessors include Dabney, Morgan & Co. and J. S. Morgan & Co.
^ The History of JPMorgan Chase & Co.: 200 Years of Leadership in Banking, company-published booklet, ©2008, p. 3. The Marine Corp. was merged in 1988 with BancOne. George Smith founded the Wisconsin Marine and Fire Insurance Co. in 1839, the predecessor company. Retrieved 2010-07-15. ^ On September 25, 2008, JPMorgan Chase announced the acquisition of Washington Mutual for $1.8 Billion. ^ "Organization Hierarchy of JPMorgan Chase & Co." (database). Federal Reserve System. http://www2.fdic.gov/idasp/BHClist_cert.asp?inCert1=1039502&inSortIndex=4&Period1Index=0&AsOf=6/30/2008. Retrieved 2008-09-22. ^ "Bloomberg: JPMorgan to Move European Head Office to Canary Wharf". 2008-08-01. http://www.bloomberg.com/apps/news?pid=20601102&sid=a.938AxCO1mU&refer=uk. ^ Johnson, Carrie (June 15, 2005). "Settlement In Enron Lawsuit For Chase". The Washington Post. http://www.washingtonpost.com/wp-dyn/content/article/2005/06/14/AR2005061401609.html. ^ "Medicine: Mushroom Madness". Time. June 16, 1958. http://www.time.com/time/magazine/article/0,9171,863497,00.html. Retrieved May 7, 2010. Bank of Cyprus Public Company Limited · Hellenic Bank Ltd. · Marfin Popular Bank Ltd. This page was last modified on 24 April 2011 at 23:35.